This month’s Little Foodie is all about breaking down a classic kid’s favorite and using only the freshest ingredients. We teamed up with Chef Marco and The Kitchen Classes and the results were delicious! The frozen microwaveable corn dog is pretty awful nutrition-wise, but the concept is so perfect for little hands! While making it from scratch isn’t a time saver, it was such a fun process with even our littlest ones. With Kielbasa sausage, homemade ketchup, and a spicy mustard adults will love it, too! While the recipes are saved for Kitchen Classes members, this online recipe looks similar and is well reviewed! Another benefit to the live classes is Chef Marco’s tips. 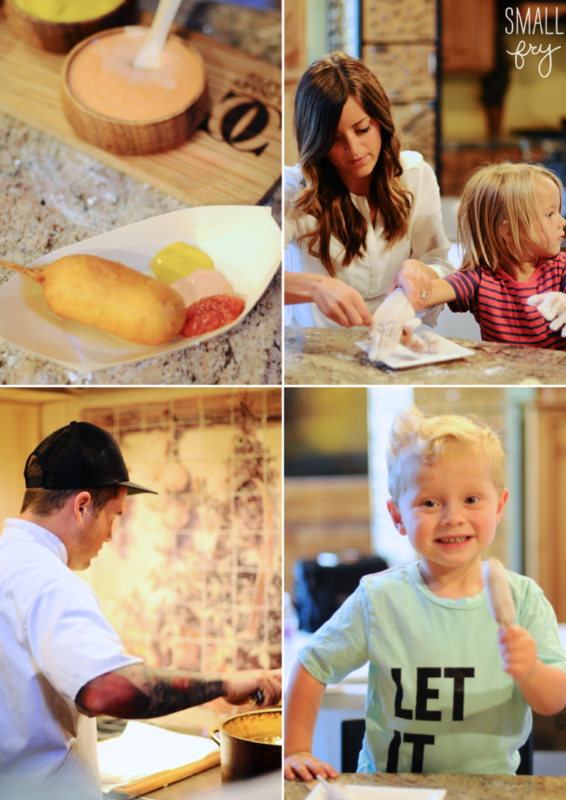 When Hayes told his neighbor “When you fry a corn dog you dip it, (shows side to side motion) swirl it (circles with his fingers), tap it” we are certain anyone can pull off the from scratch corn dog with the right guidance! Locals, check out the Kitchen Classes upcoming schedule here, it’s such a fun (and unique!) date night as we can attest, and their new kid’s classes are a hit! Follow them on Facebook for news. More Little Foodie here and here. What a super idea! I love making from scratch foods that usually are not! I will be trying this one soon. Thanks for a great blog.